Notebaert delivered the commencement address in the Compton Family Ice Arena, where the University recognized and celebrated the recipients of 240 doctoral degrees and 478 master’s degrees. He spoke of his wife, Peggy Notebaert, as his first coach. The two met freshman year in college. The Notebaerts are the benefactors of the Notebaert Premier Fellowships, which is the largest single gift ever bestowed upon the University for graduate education; they have deeply embraced the Graduate School’s holistic model of post-baccalaureate training. Notebaert exhorted graduates to pursue their passions — and to do so strategically, flexibly and with integrity. “You need to have passion. Passion creates energy!” he noted, adding that passion needs focus in order to achieve goals, whether that takes the form of a five-year plan or a 90-day plan. Additionally, drive and goal orientation must be tempered with balance and flexibility, Notebaert said. In conclusion, Notebaert urged the degree recipients to apply the “newspaper test” to all areas of conduct. This, he said, means adopting the simple conscious practice of examining choices with this question: “If I were to do this, and it were to appear on the front page of tomorrow’s paper – or, in today’s world, some blog or YouTube video – would I be OK with that?" Notebaert pointed out that personal integrity is far too valuable an asset to risk, but also that mistakes can be excellent teachers. Augusto de la Torre is the winner of the 2017 Distinguished Alumna/us Award. De la Torre received his Ph.D. in economics from Notre Dame in 1985. He served as an economist for the World Bank from 1997 until his retirement as chief economist for Latin America and the Caribbean in the fall of 2016. Previously head of the Central Bank of Ecuador and an economist at the International Monetary Fund (IMF), de la Torre has published extensively on a broad range of macroeconomic and financial development topics. Patrick Griffin is the winner of the James A. Burns, C.S.C., Graduate School Award. 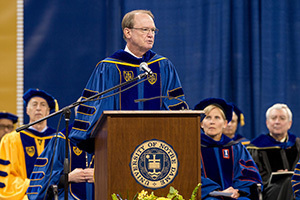 A leading scholar of American history, Griffin has made numerous contributions to graduate studies at Notre Dame — both as an active and influential adviser and through his vision and collaboration in creating and administering the Global Dome dissertation accelerator, an exchange program that enables cross-disciplinary conversation and critique. Peter Cholak was named the 2017 Director of Graduate Studies Award winner. A professor of mathematics, Cholak was honored for his thoughtful and dedicated focus on student recruitment, the development of numerous initiatives to foster community among graduate students and his success in encouraging students to apply for and win competitive fellowships. Christopher Paolucci, Department of Chemical and Biomolecular Engineering, was honored for his seminal work in computer simulations of heterogeneous catalysts, similar to the kind that occur in automotive catalytic converters. Soon to be joining the group of Jens Nørskov at Stanford University as a postdoctoral scholar, Paolucci was recognized not only for remarkable technical ability and drive, but also for demonstrating leadership in mentoring others throughout his time at Notre Dame. Matthew Kuiper, Department of Theology, is a scholar of contemporary da’wa, Islamic teaching or mission. Matthew’s first book, “Da’wa and Other Religions: Indian Muslims and the Modern Resurgence of Global Islamic Activism,” will be published by Routledge in 2018. Kuiper excelled as an instructor of record, teaching two sections of a course he devised on inter-religious encounter and dialogue. In fall 2018, he will take up a tenure-track position at Missouri State University in its religious studies department. Laura Gamboa, Department of Political Science, is a scholar of comparative politics, and in her dissertation, she offers an explanation for why incipient autocrats win elections — and why they succeed or fail in their attempts to deny the opposition a realistic shot at winning elections. Currently an assistant professor of political science on the tenure track at Utah State University, Gamboa has published an article based on her dissertation in Comparative Politics. Gamboa has also been a key co-author of a series of articles and papers on vote buying in Latin America. Renee Bouley, Department of Chemistry, contributed to the discovery of a new class of antibiotics, the quinazolinones, in fighting infections by a nefarious human pathogen, the methicillin-resistant Staphylococcus aureus (MRSA). Currently a postdoctoral fellow at the University of Michigan conducting research in cardiovascular diseases in the lab of John Tesmer, Bouley is the recipient of numerous prestigious awards, including a National Institutes of Health Ruth L. Kirschtein National Research Service Award Individual Predoctoral F31 Fellowship. Originally published by Amanda Skofstad at news.nd.edu on May 20, 2017.